I liked Belmont Village a lot, and I had a great first impression. Everything about them is great. The rooms were about like most but bigger. It's the most expensive and the highest quality of the ones we've looked at. My mom has eaten there twice, and she loved it. The location is in an elite part of town. There were a lot of people in the common areas, and I saw a lot of people at dinner; they were having some kind of community meeting while I was there. My mom is in Belmont. It’s a very good assisted living place. It’s very impressive, and super clean. It has very friendly staff, and a lovely physical facility. Belmont Village was wonderful. It was my favorite one out of the places we visited. It’s a very warm and caring place. They offer assisted living and memory care. They had 1 and 2-bedroom apartments. For people who have mild dementia, they can just stay in their apartments as there were just people who come for their needs. They had many programs, and they take you to any grocery store that you want, anytime you want. They will take you to any doctor that you want. There is a hospital that is very close by. They have a nursing staff 24 hours 7 days a week, at least one. They have two meals and a snack free; if you want three, you can get three, and that is what I like it best. Belmont Village was so expensive, and they wouldn't allow me to bring my dog. They said it was too big. They bought me lunch, picked me up, took me there, and I went through a meeting with several officers. It was a great facility, but it was just that I could not bring my dog. We've been here at Belmont Village Turtle Creek since November and it's a brand new facility. It's a seven story building. It has beautiful-appointed furnishings. The surroundings are just gorgeous. They really took time and effort to make it an elegant place to live. Our apartment is very roomy and we have two bedroom and two bath. We also have a little balcony that we can get out. It has a nice swimming pool and exercise room with several exercise machines. The only main concern I have is, because it a brand new facility, they have great turnover with regards to their staff. Belmont Village Turtle Creek was beautiful. We visited twice and liked it both times. This place is at the top of our list. We loved Vivian a lot; she was very personable and wasn't pushy. She's in love with the property, and it's very clear that she likes working there. The apartments were nice, large and roomy. They had two-bedrooms in the size we wanted. The price was way more than we can afford. Their facilities were beautiful, and the whole thing was gorgeous. They had a heated indoor pool up on the 7th floor. My 92-year-old aunt didn't shy away from the multi-level building, but it bothered her to think about what would happen in case of an emergency. We had a meal there and it was delicious. I don't have any bad things to say. I don't have to do anything. I have a lovely breakfast and wonderful lunch and I go to nightly entertainment. The wine and cheese is great. The cello and violin is pretty music. I like the staff and they like me. I don't have any dislikes. I asked if we could have chicken, fried steak and they fixed it up, especially for us. And it was good! This is the best place I could ever be. My family chose it. I never even saw it before coming here, but my kids said it was the best, and it is! People love the food here. Preparation is always nice and presentation is lovely. Everybody loves the food. The staff is always so nice. They're great. PALs know my name and they'll always say hello. Let me emphasize how much I love living here and how much I appreciate everyone for what they are doing for me. By Jim & Ruth K.
Because we don't want to overlook any of our wonderful PAL helpers, we aren't going to mention specific names. Please know how grateful we are for all you do. The countless big and small things you do make our lives more comfortable. Our laundry done and carefully folded and put away, our clean kitchen, our packages opened for us, these are just a few of the jobs you do for us. Your more important gifts to us are your attitude. The staff is terrific. They are a bunch of hard workers. They make our tenure here more pleasant. 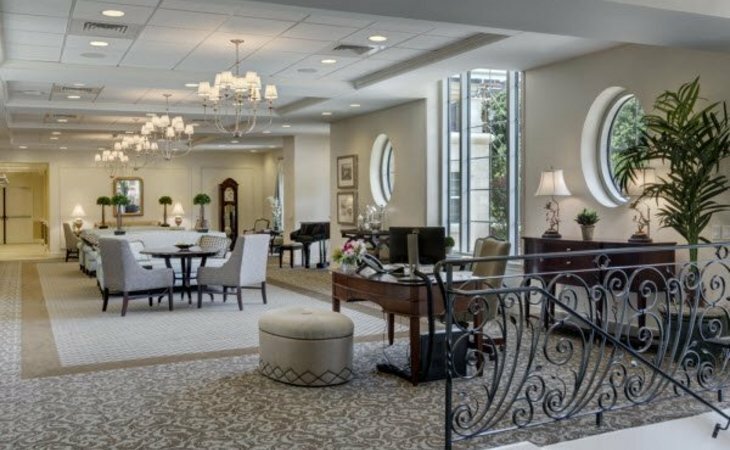 Beautifully situated in the heart of the Turtle Creek community, Belmont Village Senior Living offers easy access to an array of high-end dining and retail centers, world class medical care, numerous churches and synagogues, and the Dallas Theater Center and Arts District. Concierge services and daily scheduled transportation are available to make sure that residents don't miss a minute of their active lifestyles. Additionally, we are a proud sponsor of the Dallas Institute of Humanities and Culture, an organization dedicated to enriching and deepening the practical life of the community with the wisdom and imagination of the humanities. Belmont Village looks forward to partnering with the Institute to enhance our enrichment programs for residents and employees and to make special programs conveniently available to our neighbors in Turtle Creek. Belmont Village Turtle Creek provides a full continuum of lifestyle and support, including Independent Living, Assisted Living and Belmont's range of signature, award-winning Memory Care programs designed to maintain mental acuity and function. The French-provincial style mid-rise houses 201 private apartments with studio, one-and two-bedroom residence plans. No buy-in is required and monthly rates include a variety of services and amenities. Belmont Village's valet service and two-story underground garage ensure generous parking for residents, guests and staff. Our professionally managed fitness center and indoor swimming pool encourage wellness and allow us to offer physical, occupational and speech therapies on-site. A technology center and complimentary Wi-Fi service throughout the building helps residents to stay connected. Dining options include chef-prepared meals with over 24 daily menu choices in Josephine's Kitchen and a bistro for casual dining. Located directly across from Lee Park and Arlington Hall, Belmont Village's outdoor amenities reflect their surroundings with a garden terrace, private courtyard, dining patio and fountains. What should caregivers and potential residents know about Belmont Village Turtle Creek?